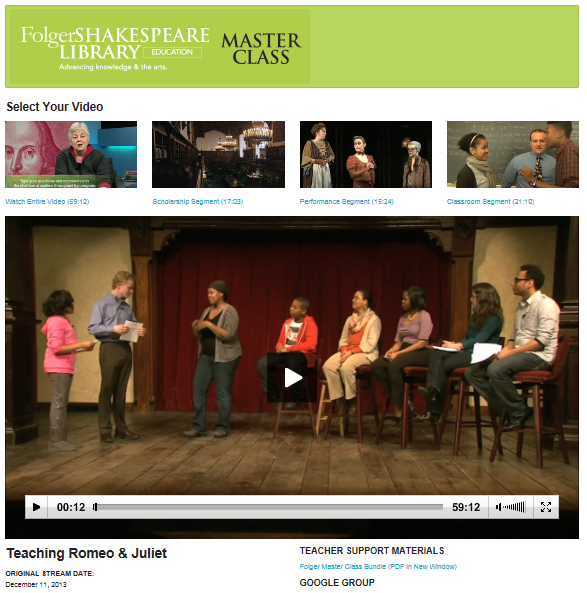 Last month, Folger Education streamed a live master class on Teaching Romeo and Juliet. Hundreds of teachers participated, and afterward we asked for your feedback. The response was so positive! Many of the teachers surveyed said they appreciated the well-rounded approach embodied by our three video segments on scholarship, performance, and the classroom. It’s great to get this kind of feedback from you. Teachers are the rockstars in our book, and our job is to help you do what you do best. We’re on it! And if you didn’t get a chance to participate in the master class live, you can watch a recorded version online. Happy teaching!